but I finally got my new lens, and just had to experiment with it! For those who are wondering, it is a Canon 50mm f/1.8 lens. I quite like it when I am wearing a flowy skirt and it is windy. gorgeous outfit! the skirt length is perfect on you! love it myself! That's awesome that you got a new lens! I can definitely tell the difference in the photo quality. You look stunning as usual, and I definitely am loving your skirt! I think that skirt is a great length and looks really good with the stilettos, which keeps the outfit edgy. I love the print on the skirt! You have such a keen eye for such interesting details, including colors! I love it. I love all your outfits. I love love LOVE what you're wearing. The muted color scheme makes the mixed prints looks so sophisticated and your amazing shoes add the right amount of modern style to offset the length of the skirt. The silhouette of this outfit is incredible. Again, I love. I really love the proportions of this outfit, it makes you look so amazingly tall! I adore this length on you. You look amazing as always! You look adorbs! I'm afraid of wearing skirts like that, but you totally pulled the look nicely! That skirt is just beautiful! Oh, great print. I love the long length also. I wish I could pull it off. Love the skirt, it has a really great length, and the print is lovely. and I just adore the shoes they are so pretty! i know what you mean about the flow of longer skirts...i'm wearing a maxi now and i can't help but flip it on the sides when i walk around the office..hehe. Beautiful hair ;) Love the new lskirt enght! You look beautiful.I fell in love with that skirt! The skirt looks so pretty! The heels are so perfect with it too! I always worry that if i wear a long skirt i will look like a mum but you have styled it in such a young, way so I really love it!! That skirt length looks amazing on you, adore the pattern. I got a 50mm recently and haven't used it on outfit shots yet but hopefully soon. Love all your layering. Another gorgeous outfit, love the print of the skirt but that shirt is also pretty amazing! i love the way you throw your blazer on. the skirt is just really beautiful and gets along with the blazer so well. i have the same lens for my camera, i love it! yes! it really helps! Try it. I just made some passion tea with lemonade.. It was delicious. you look so fabulous as usual. love this combination of ur outfit. Great pictures! I want a new lens myself! Really love the outfit, it is gourgeous! I agree - those longer hemlines are so feminine. 1. i love your blog. 2. i love this outfit. Gorgeous, gorgeous, gorgeous! I love the outfit all together. Ps. Thanks for the comment! Wow you are the cutest thing ever! I love the skirt, everything is styled so perfectly! Cute blog! I am in love with your shoes! lookin good in the hood! Way cute- love the skirt length and the pattern is amazing! 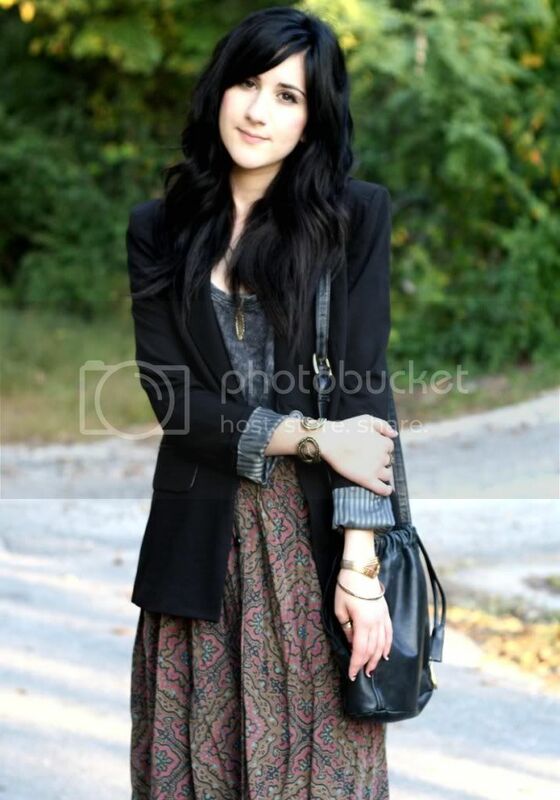 that skirt is so pretty love it and your blazer alot! I love how you layer your outfit. The skirt is gorgeous, and so are you. I adore your outfit. 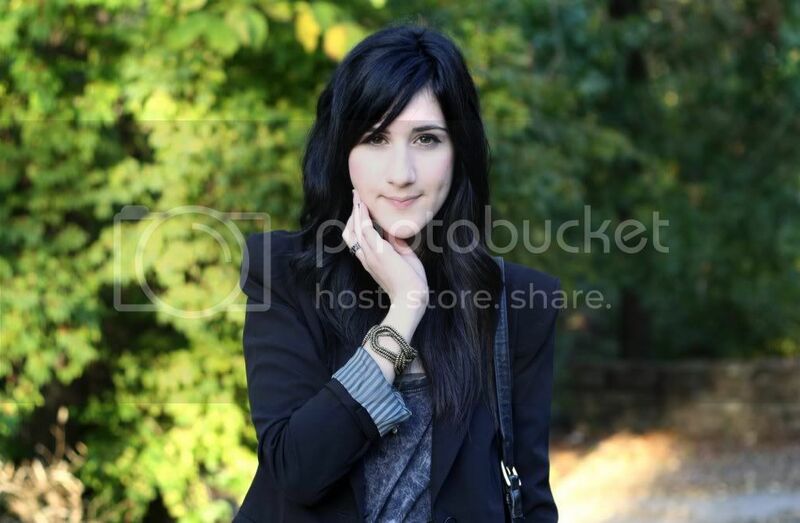 The blazer, the grey sweater, the skirt...And is your hair longer? It looks great too. I have a question for you. I also want cut my bangs so they can be from the side, like yours. So i want to ask do they always stay from the side or they fall. wow you're just so pretty. you can pull anything off. your skirt has the perfect length!! 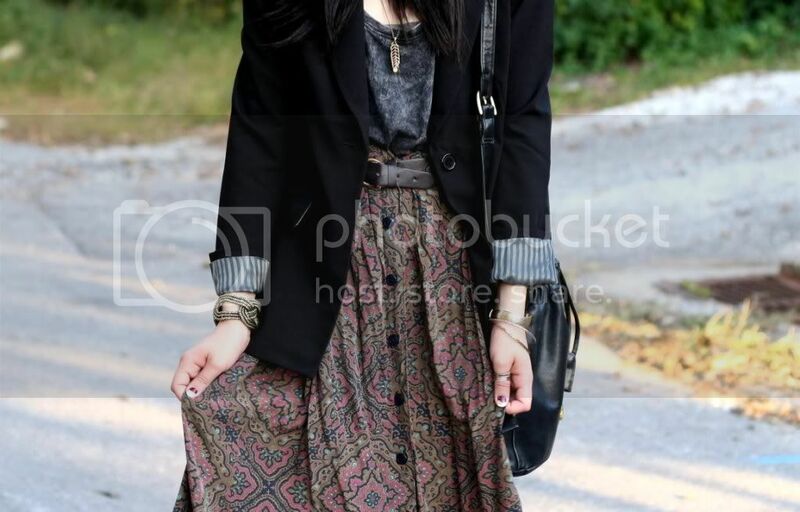 Loving the flowy boho skirt. Adds a little but not too much. Your hair is gorgeous and you have major style! stunning outfit! love the vintage vibe, textures and print of the skrt!defintely CHIC! perfect combination! i love that skirt!!! gorgeous skirt -you look fab! i have the exact same lens as you and it is amazing..! ps love the skirt length, its a refreshing look and its always fun to mix things up a bit! Really love the skirt!! Makes me want to run out to a thrift store! 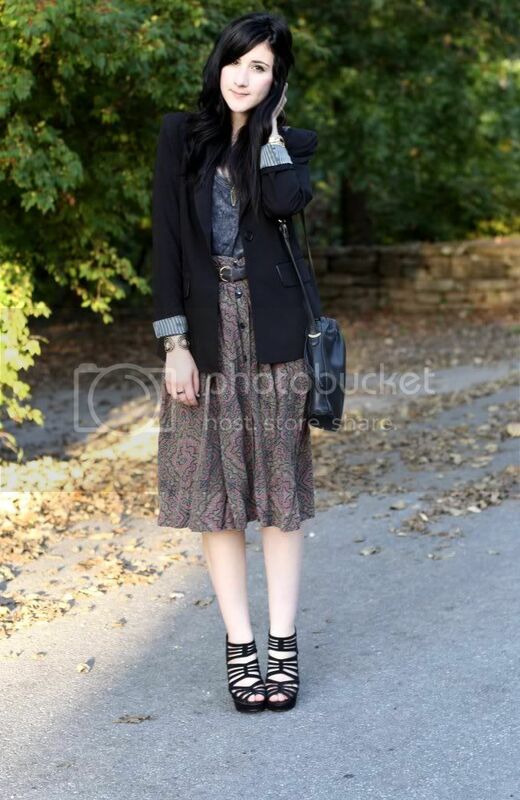 Great outfit and photos, you have such lovely style! I saw your blog and I wanted to invite you to follow my blog. that skirt! and that bag!